The economies of the 16 countries that make up the eurozone declined by 2.5% in the first three months of 2009, the EU's statistics agency Eurostat said. Analysts had forecast a drop of only 2%. A sharp fall in German exports was a key factor in the decline. The German economy suffered its largest contraction since reunification, falling 3.8% in the first quarter. Eurostat also said that consumer price inflation in the eurozone remained steady at 0.6% in April. GDP in the eurozone fell 4.6% on a year-on-year basis. GDP measures the value of all goods and services produced in a country. GDP also fell 2.5% in the wider EU. About 60% of the UK's exports go to the 27 countries in the EU. 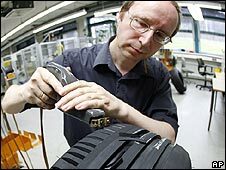 The record decline in German GDP was led by falls in exports and investments, the Statistics Office said. Year-on-year the German economy shrank by 6.7%. The German government has predicted the economy will shrink 6% in 2009. That is a more downbeat forecast than the European Commission's. The Commission expects Germany, Europe's biggest economy, to contract 5.4% this year. It predicts a contraction of 4% across the eurozone. The severity of the contraction surprised economists. "The figures came in a bit worse than even we had expected and are significantly worse than the consensus," said Joerg Kraemer from Commerzbank. "In the first quarter, the German economy fell victim to the 'uncertainty shock', which has gripped the world economy since the collapse of Lehman Brothers." The fourth quarter of 2008 had previously been the worst on record, with GDP falling by a revised 2.2%. On Thursday, Finance Minister Peer Steinbrueck admitted the German government would announce record budget deficits for 2009 and 2010. 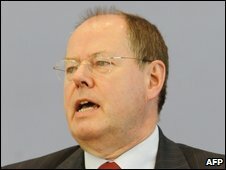 Mr Steinbrueck said the deficit - the difference between a government's spending and tax take - would exceed 50bn euros (£45bn) this year and rise to 90bn euros next year. The current record is 40bn euros set in 1996. Germany unveiled a 50bn euro economic stimulus package in January and has spent heavily on bank bail-outs. Mr Steinbrueck's forecasts mean that Germany is likely to miss the EU's target for eurozone countries to restrict their deficits to within 3% of their GDP. Also on Friday, provisional data showed the French economy contracted 1.2% in the first quarter, in line with forecasts. The fall in French GDP, reported by the statistics office Insee, was smaller than the 1.5% drop seen in the previous quarter. In a statement, the Economy Ministry said it expected the French economy to contract by 3% in 2009. Meanwhile Italy's GDP declined 2.4% in the first quarter - the largest fall since records began in 1980, statistics agency ISTAT said. On Thursday, the National Statistics Institute in Spain said the Spanish economy suffered its largest contraction in 50 years. GDP fell 1.8% in the first quarter.